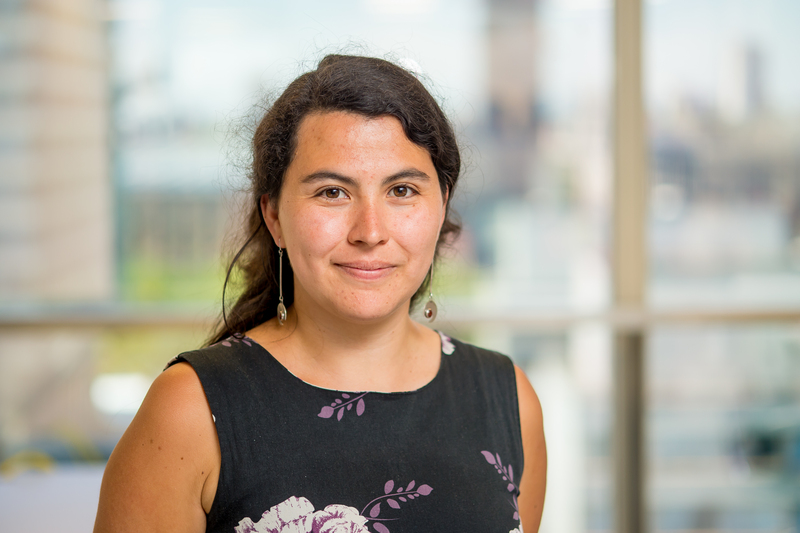 Camila Munoz, a third year PhD student on the CDT, won a grant from the Postdoctoral Researcher Support Scheme. This is a new grant launched by the Centre for Medical Engineering. My name is Camila Munoz and I a third year PhD student at the Biomedical Engineering Department at KCL. I moved to London almost four years ago to start my PhD in the CDT for Medical Imaging under the supervision of Dr Claudia Prieto and Professor Andrew Reader. My research focuses on the development of techniques for motion correction in cardiac PET-MR imaging. A typical PET-MR examination takes about 15 minutes, and during that time the heart is continuously moving due to the respiratory and cardiac cycles. If the motion of the heart is not compensated for, we obtain blurred images that cannot be used to make accurate diagnoses or therapy decisions for cardiac diseases. I have developed a framework that allows us to measure the cardiac and respiratory motion from MR images, and then uses this information to correct both the PET and MR data so that the final images are focused and small features such as the coronary arteries can be well depicted. What is the grant and how did you hear about it? The Postdoctoral Researcher Support Scheme is a new grant launched this year by the Centre for Medical Engineering to support PhD students who are about to complete their degree so that they can obtain research experience and data to use towards a fellowship application in the future. We regularly receive information via email about different grants and funding opportunities for early career researchers, and this one was suitable for my interests and expertise. What do you hope to achieve with it/ what does it mean for you and your research? During the last year, we have tested the approach for cardiac PET-MR imaging in different cohorts of patients in collaboration with other research centres in the UK and Europe. During this process, we have realised that there’s a lot of room for improvement in terms of speeding up the examination time and increasing the resolution of the images. We have some preliminary ideas about how to do this, which we want to explore and develop with the support of this grant. We hope that this research will give us new insights on the potential clinical impact of cardiac PET-MR imaging for the diagnosis and management of different cardiac pathologies. When applying for the Postdoctoral Researcher Support Scheme I discussed a lot with my current supervisor, other academics and clinical fellows within the department about the ideas and specific aims we were putting forward for this grant. They gave me excellent feedback from different perspectives, ranging from offering a broader vision about unmet clinical needs to advising which technical developments are achievable considering the duration of this grant. I strongly encourage people that want to apply for this grant to talk to the academics and fellows with more experience.